An initiative that our organization, Hands From The Heart Home Healthcare Services, has taken on within the past six months is Stroke Education and Advocacy. We pride ourselves on educating our communities on Stroke Prevention and offering Stroke Recovery Services to our clients with Non-Medical Caregivers trained in Stroke Recovery. Strokes are the third leading cause of death in the United States, and the leading cause of adult disability with approximately 800,000 people experiencing a Stroke every year. Strokes occur when there is a disruption in blood flow to the brain. We are educating our communities on Stroke because 80% of Strokes are preventable! 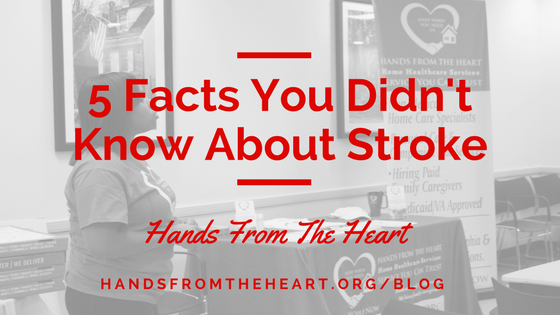 The more you know, the more you can do to prevent a Stroke from occurring to you or your family member. There are three types of Stroke, a Hemorrhagic Stroke caused by a brain aneurysm or blood vessel leak, an Ischemic Stroke caused by a blood clot blocking the flow of blood to the brain, and a Transient Ischemic Attack (TIA) cause by blood flow stoppage for a short period of time. Risk factors for Stroke include: obesity, lack of physical activity, heavy drinking, use of illicit drugs, high blood pressure, high cholesterol, Diabetes, Cardiovascular disease, and family history. African Americans have higher risks of Stroke — they are 50% more likely to experience a stroke than Caucasians. Men are at a greater risk for having a Stroke than women. Think F.A.S.T.! Face drooping, Arm weakness, Speech difficulty, and Time to call 911! There are several changes that you can make to your every day life that can help prevent a Stroke. Exercise is extremely important for our bodies to function properly, including a 30 minute workout 5 days a week will make the world of a difference. Eat healthy and choose foods with a high source of antioxidants. Avoid smoking and high blood pressure at all costs. Stay happy and healthy moving around throughout the week by keeping your brain challenged and body moving. To stay informed on our latest Stroke Educational Presentations, or to share your #StrokeStory, follow us on Facebook, Twitter & Instagram. We offer Stroke Presentations at Senior Centers, Assisted Living Facilities, Library Systems & More! Contact us at 844-6-HomeNow for more information.